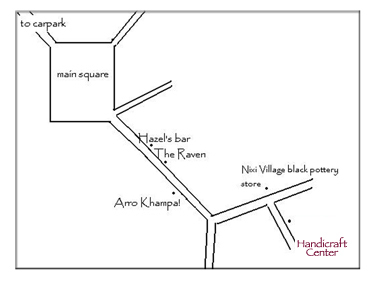 The Shangri-La Women’s Development Center is located in the heart of the old town. 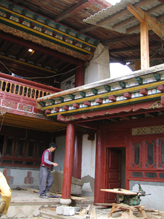 After working with YMHF interns, Eric Chen and Natalie Kwan during July and August, planning, drawing, painting and more, the lovely old Tibetan house was ready for the big opening ceremony held August 7, 2006. The rent and renovation of this building was made possible by a generous grant from the Hong Kong Federation of Women and Ms. Pansy Ho. 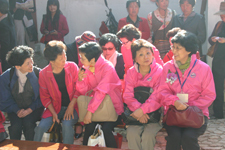 A group of twenty five members of the Hong Kong Federation of Women made the long trip to Shangri-La to officiate at the opening. Among the participants was Mrs. Betty Tung, wife of the former chief executive of Hong Kong, herself chairlady of several charitable foundations in Hong Kong, Mrs. Peggy Lam, chairlady of Hong Kong Fed of Women, Ms. Pansy Ho, philanthropist and entrepreneur, Ms. Annie Wu, member of the standing committee of the CPPCC. 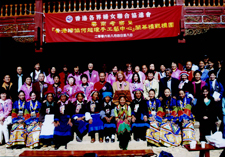 Governor Qi Zhala was present as well and praised the contribution as a step towards helping the women of the region in handicraft development in a welcoming speech at the opening in the new center. Friends of Yunnan Mountain Heritage Foundation from Shangri-La were also present for the ceremony. Tibetan folk artist, Cairan Dan and his accompanist Neema, as well as female vocalists from the A Bing dance troupe performed traditional Tibetan songs. Women artisans from Hamagu and Kanzisie villages brought hand made yak and sheep wool handicrafts for exhibition. A Yi artisan sold her traditional lacquer tableware. 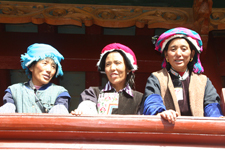 Three local Tibetan women artisans brought hand made goods from the collection of clothing and accessories they are developing. 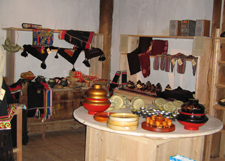 Yunnan Mountain Heritage Foundation also featured Tibetan pottery and hand woven table runners and other crafts designed by our staff and made to order from nearby villages to promote work of local artisans. I was very happy to have the opportunity to publicly thank the Hong Kong Federation of Women and Pansy Ho for the generous contribution which allowed us at YMHF to create a home in which we will be able to develop programs and handicraft designs with local artisans. I was thankful for the help of women artisans at the opening. Summer is the busiest time for women in rural areas around Shangri-la with the harvest of mushrooms in full swing, yaks out to pasture, fields to be tended. They brought crafts, carpets, looms to demonstrate weaving to the center. The Shangri-La Women’s Center has a meeting room on the first floor which can also double as training facilities for handicraft and entrepreneurial skills. There will be a shop to sell local traditional handicrafts providing opportunity to local artisans to showcase their handicrafts skills. There will be guest rooms for visiting students, teachers and trainees. Other facilities at the Center include a large common room, office space, library/info center, community bulletin board, a kitchen, two toilet/shower units, and storage facility. There is a large unfinished room on the first floor which could be developed in the future: old town museum? So many members of the community came during the renovation period and opening to lend us a hand. Thanks to all of our friends in Shangri-La. Wangman (Jenny) joined the Handicraft Center in the summer of 2008 after a month of volunteering in Shangri La. She is ready to welcome you and tell you all about our projects and Handicraft store. Duan Ayi will make you a cup of yak butter tea and tell you stories from her home town in Weixi county, one of the three Shangri La Prefecture counties. In the second picture below is Yang Hongmin is the librarian in our new community library.